Preheat oven to 450°F. Cut sweet potatoes in half lengthwise, then into 1/2 inch strips—this will create wedges; if you want your fries matchstick shaped, cut strips in half. Parcook the fries in the microwave for 15 seconds (without added liquid) to speed cooking time in the oven. 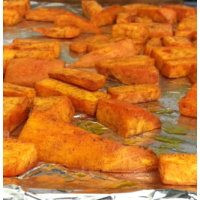 Toss the sweet potatoes with oil (additional oil will make for a crispier fry, but also add extra fat—make sure they are at least coated), sprinkle wedges with salt and spices, if using, and spread in a single layer on a sprayed baking sheet. Bake for 25 – 30 minutes, or until brown. Serves 4.